Follow your guide for a fun sightseeing ride on the Saint Lawrence River. Discover the river and its attractions, starting at Jacques-Cartier pier in the Old Port of Montreal. 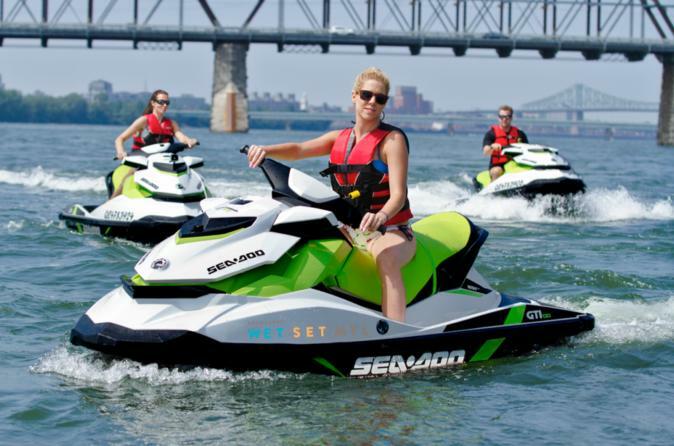 On each tour, you'll have 15 to 25 minutes to jet ski freely. All excursions include a guide, gasoline, liability insurance, a water-repellent suit, and a life vest. It's a unique experience to try in Montreal! Upon your arrival at the boat reception in the Old Port of Montreal, you must sign a discharge of responsibility and follow a short boating safety course offered by your guide before departure. After briefing, follow your guide up the Saint Lawrence River and discover Montreal on an exhilarating experience! After passing under 4 bridges (Concorde, Victoria, Champlain and Estacade) and near the habitat 67, the tour will take you to the bassin des Prairies where you will be able to drive your jet ski freely for 15 to 25 minutes. On the way back, your guide will bring you near the biosphère, St-Helene Island, la Ronde and finally, the highlight of the tour, under the Jacques-Cartier Bridge. Please note: Drivers Licence is require to drive the jetski. Passanger must be minimum of 6 years old. A deposit of $750 is required and will be reimbursed upon your return if the jet ski is not damaged in any way. The guided tour includes a guide, gasoline, liability insurance, a water-repellent suit and a life vest. Lockers are available for your personal items and a changing room with towel. You must be ready 30 minutes before your booked departure time.